PSFK is the go to source for new ideas for creative business. Our events bring to life the discussion that takes place everyday on our site with a focus on particular areas of innovation. On the morning of April 28, PSFK returns to Soho House West Hollywood to host a discussion on the topic of Transmedia Storytelling. The goal will be to explore how entertainers and content creators are creating richer experiences for their audiences by weaving narratives across mediums. We will also aim to understand how new platforms for sharing, entertaining and fundraising are changing the entertainment landscape. 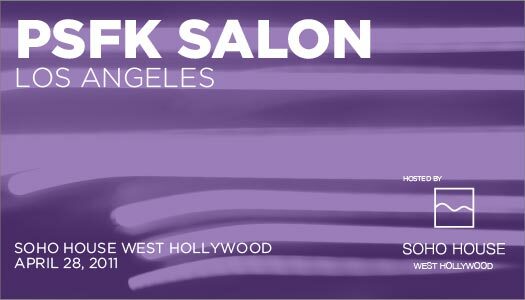 At PSFK SALON LOS ANGELES, a number of innovators will share their own tales of online and offline adventures. Come join an intimate audience of creative professionals who will listen and discuss the topic of Transmedia Storytelling at the stunning Soho House West Hollywood (Soho House membership not required for attendance).